← Join us for our kick off! 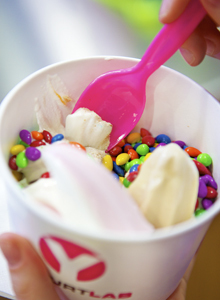 There’s no better night to mix and mingle at YogurtLab Xpress! On Tuesday, October 26, from 6 to 9 p.m., come join us for a great cause — 15% of every frozen yogurt purchase will go directly to St. Jude Children’s Research Hospital. Internationally recognized for its pioneering work in finding cures and saving children with pediatric cancer, St. Jude has a unique mission: It’s the only pediatric cancer research center where families never pay for treatment not covered by insurance. No child is ever denied treatment because of the family’s inability to pay. YogurtLab Xpress is located on the south end zone of Bryant-Denny Stadium in the new Market Place. Customers may park in the gated lot on the southwest side of the stadium (between the stadium and Rama Jama’s). YLX will provide tokens to customers who park there.